What no one ever tells you about being an author is that it mostly involves schlepping a lot of books from place to place. Sure, there’s some writing involved (and, oh, if only I had time to do more! ), but in the end, writing is not just an art and not just a passion—it’s a business. That means selling books. And that means schlepping them around. Fortunately, the business of writing can be one of the coolest businesses to be in. I get to meet some fantastic, interesting people, and I get to share with them the stories I love so much. I also get to enjoy warm hospitality, see some beautiful places, and do some wicked cool stuff. Life really doesn’t get any better than that. It’s a blessing to be able do this job (which might strike some people as a strong word, but I really do think it’s true). I am deeply grateful to the many, many people who make it possible. Because I sometimes get questions about what it’s like being a historian/author/professor, I thought I’d share a glimpse of my manic May, which felt like a combination of “Where in the World is Carmen Sandiego” and “Where’s Waldo,” all done up in shades of blue and gray. Generally speaking, May is always a busy month for me: not only do I typically have to wrap up the spring semester, but the spring Civil War campaign season kicked off in May once upon a time. Three of the four battles I write about most often have their anniversaries in May, which means lots of time-sensitive stuff to do. 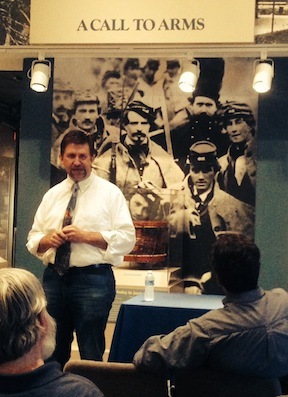 This year’s sesquicentennial of the Overland Campaign made it even worse: May was on steroids. Phill (left) and I receive bright-blue boxes of what looks like Chinese take-out from Pete Rainey of the Wilderness Study group (they were actually beautiful crystal glasses). 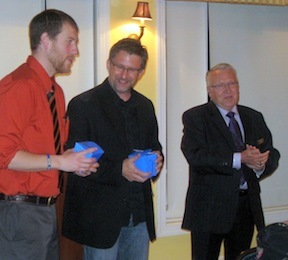 I kicked things off on Saturday, May 3, as the keynote speaker for the Lake of the Woods Study Group’s annual dinner. I was privileged to be on the bill with my good buddy Phill Greenwalt, who was there to speak about an ancestor of his who was killed at the Wilderness. We were also joined by Dan Davis for a book signing. Phill and Dan’s book, Hurricane from the Heavens: The Battle of Cold Harbor, had just come out, and as the book’s midwife (er, I mean, editor), I was proud to see Dan and Phill enjoy such a nice splash. They’ve been enthusiastic partners to work with. 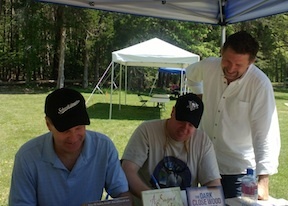 Don Pfanz (left) and Bert Dunkerly (center) sign copies of their new book “No Turning Back” while I make like Grant hovering over Meade’s shoulder. Unfortunately, I had a death in the family that took me away from the rest of the Wilderness anniversary, but I was back on the morning of May 8, on the edge of Spindle Field (just like the Federal army). There, I joined historians Don Pfanz and Bert Dunkerly for a book signing at the Spotsylvania Battlefield exhibit shelter. Their book No Turning Back: A Guide to the 1864 Overland Campaign had also just come out and, as with Hurricane, I edited the book. 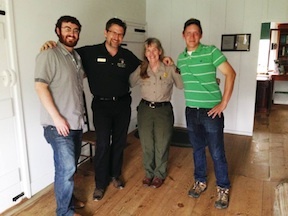 Daniel Davis (left), me, Becky Cumins, and Edward Alexander at the Jackson Shrine on May 10, 2014. May 10 found me going back in time a year, from 1864 to 1863. For nine years, I have worked at the Jackson Shrine on the anniversary of Jackson’s death, and I wasn’t about to break the streak this year, Spotsy Sesquicentennial or not. I feel especially entwined with the story of Jackson’s death, for all sorts of reasons, and that’s why The Last Days of Stonewall Jackson remains, to this day, my greatest literary labor of love. 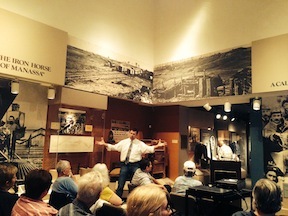 On May 10 at the Shrine, I got to work with one of my very favorite NPS historians, Becky Cumins, who loves the Jackson story and the Jackson Shrine as much as I do, so that was a really nice treat. 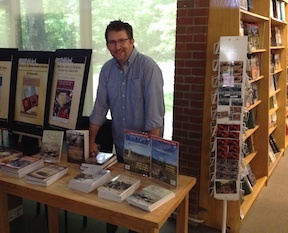 We also had visits from a couple ECWS authors: Dan Davis and Edward Alexander. Edward, who works at Pamplin Historical Park, has a Petersburg-related book coming out next year, which we’ll share details about soon. 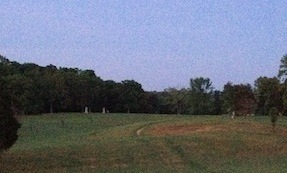 May 12 found me getting up well before dawn in order to be at Spotsylvania’s Bloody Angle to help with the NPS’s real-time tour. This is the piece of ground that’s most special to me, so to be there at that time on that day was chilling in all the best ways. 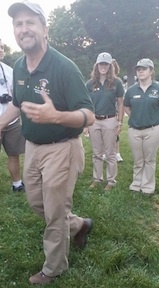 I’ve given more Bloody Angle tours than any of the other tours I do at the park, I think, but on this morning, I was there in a supporting role as one of several volunteers there to help the inestimable Frank O’Reilly lead the tour (and what a fantastic tour he gave). One of my jobs was to count attendees—the NPS loves its statistics—so as the guy with the clicker, I got to be the first person over the Confederate works, in real-time, so I could position myself at a good spot to count heads. Being first over the works was a real privilege. On the afternoon of May 13, a busload of visitors from the McKean County Historical Society rolled into town from northwestern Pennsylvania. That’s Bucktail Country for folks who don’t know. More importantly to me, that’s my home territory! For ten years, I’ve led a double life between McKean County, PA, and Spotsylvania County, VA, and I hardly ever get to share one with the other, so it was particularly exciting for me to have a group of folks from “back home” join me in Virginia and let me show them around the battlefields I love so much. We hit all four, plus the Jackson Shrine and Salem Church, with lunch thrown in one day at Stevenson Ridge, so it was a jam-packed two-and-a-half days. The new museum at CVC looks great, and I was honored to be there for the opening. On May 17, the NPS held a ribbon-cutting ceremony for its new museum at the Chancellorsville Battlefield Visitor Center. What a splendid, splendid job they did on that new museum! The bookstore at CVC invited me to come in and sign some books during the morning, which was a fun time to be there with all the hubbub going on. The exhibit redesign had been delayed for some months, but the wait was well worth it. It’s an immersive, interactive experience (and best of all, they managed to keep the two old dioramas—Stonewall’s wounding and the Bloody Angle—while updating them to fit into the overall redesign). My family first fell in love with Stonewall Jackson in Manassas, so to return there to tell his story felt like things had come full-circle. In the midst of all this, I’d been doing some blogging here at the site. Kris had been doing a lot of the heavy lifting on days when I had events scheduled, but I tried to pick up the slack on days when I could. Cranking out so many words under pressure was a huge rush. Along with what I’d done already, I was specifically responsible for the march out of Spotsy and the North Anna phase of the campaign, which I love. 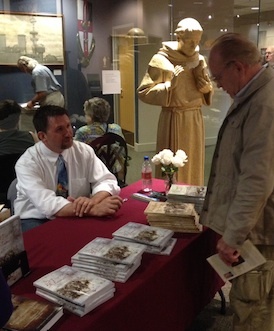 I teach at a Franciscan university, so it was only appropriate that St. Francis (background) kept me company as I signed books at VMI. My lovely wife, Jennifer, had been with me for most of May’s adventures, and so on Friday, May 23, we decided to take full advantage of our scheduled excursion. After a morning drive-through of North Anna in honor of the Sesquicentennial, and then an early lunch meeting in Richmond, we headed west toward the Valley. 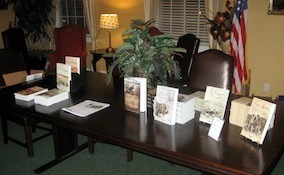 I had a book signing at the Virginia Military Institute Museum in conjunction with the biennial Stonewall Jackson Symposium. Jenny and I took our time driving along the Blue Ridge Parkway to enjoy the breathtaking scenery. We then did a brief tour of Lexington before having dinner downtown. At the museum, we talked with a lot of great folks and I had the chance to meet some old friends, including Peter Furmick, a volunteer at the Jackson House who has, for years, given horse-drawn carriage tours of the town. Bill and Corty Freeman also stopped down to say hello; Corty is Stonewall Jackson’s great-great granddaughter. Even fellow Savas Beatie author Matt Lively popped by for a visit. Some great friends in Lexington: Peter Furmick, Bill and Corty Freeman, Matt Lively, and Little Sorrel. I had an easier time telling the stories at the Luminaria than my face probably suggests. That’s a heavy note to wrap up the month, I realize—but it’s a sobering reminder of why I do what I do. It sounds like a lark—and make no mistake, it’s a lot of fun doing this—but I do it for guys like Kuhl and Young and the hundreds of thousands of other guys who lost their lives in the war. I don’t want their stories or their sacrifices to be forgotten or taken for granted. I want to share their stories and the larger story of the war with as many people I can in as many ways as I can. I want to do my part to help us all remember. That’s my call to arms. This entry was posted in Books & Authors, Civil War Events, Emerging Civil War Series and tagged Becky Cumins, Bert Dunkerly, Bloody Angle, Bucktails, CVC, Daniel Davis, David Ruth, Don Pfanz, Edward Alexander, Frank O'Reilly, Fredericksburg National Cemetery Luminaria, Hurricane from the Heavens, Jackson Shrine, Lake of the Woods, Last Days of Stonewall Jackson, Manassas Museum, No Turning Back, North Anna River, Phillip Greenwalt, Spotsylvania, Stevenson Ridge, Stonewall Jackson, Virginia Military Institute, VMI, wilderness. Bookmark the permalink. Wow, Chris! I envy you completely! My May was spent fighting for Common Core classrooms in Math, trying to finish a paper for APU, and just fretting in general. Seriously–everyone–Chris & Kris are two of the most dynamic folks out there. I have been given chances an old, fat lady would never have even hoped for! And because of them, I am beginning to think that the last 1/3 of my life might be the best ever. Your confidence in me, and your examples of energy and commitment have given me such a lightness of spirit. Huzzah!